With the strategically advantageous location of Brunsbüttel at the lower Elbe and at the Kiel-Canal the group of ports at Brunsbüttel — Elbehafen, Oilport and Port of Ostermoor — offers direct access to North and Baltic Sea as well as to the European inland waterways, as they are close to Hamburg with available industrial areas next to the port. The Elbehafen is a multi-purpose port which unites water, rail and road in a highly professional manner. Fast turnarounds, high levels of productivity and safety as well as total reliability are the basics for flexible, economical just-in-time operation. The oil port is located within the Kiel-Canal, near the locks of Brunsbüttel. Five jetties make it possible to handle a wide range of refinery products in liquid form. The port of Ostermoor, also located within the Kiel-Canal near the lock of Brunsbüttel, essentially is used as a port for the local chemistry companies in the park ChemCoast Park Brunsbüttel. The port makes it possible to handle the goods on four jetties. Brunsbüttel Ports GmbH is a competent service provider for the handling of all sorts of bulk goods.The ports at Brunsbüttel handle millions of tonnes of dry bulk goods yearly: for example copper ore concentrate, coal, building materials, urea and many other commodities in mostly covered systems. With motivated and flexible staff, proactive thinking and economically optimized working processes the port focuses on its customers’ demands 24 hours a day, 7 days a week. For the last few years Hansen Industrial Transmissions (HIT) had been very successful in selling single stage blower drives. Having no dedicated single stage solution for the larger sizes, a special solution was designed starting from the standard horizontal, parallel, 2-stage ‘Hansen P4’ housing (size G, H, J or K — with one gear set). What started as a one-off project has since turned into recurrent business. These applications however would not benefit from a specific ‘large’ single stage housing i.e. those used for the P4 single stage units with a dedicated housing. HIT therefore re-used its current robust P4 2-stage housing. Using its in-house resources HIT generated a large number of possible gear sets. From a mechanically optimized subset a final selection was made looking at dynamic and noise properties which led to a highly optimized gear set range. With a selection ratio up to 1% exact in almost any case the optimal working speed is matched as near as possible. The specially designed lubrication for this new product range — based on the multi Megawatt principle — ensures the gear set and all bearings are pressure lubricated. A new type of sprinklers caters for optimal oil distribution over the gear teeth. Due to the high installed powers, a cooling group is indispensable. Taking into account the high peripheral speeds at the shaft ends HIT provides its ‘Hansen Oil-lockTM’ sealing at all shaft ends and dimensions the oil drains large enough so no pressure is built up and leakage is prevented. Before the summer HIT delivered two size U Hansen P4 gear units and a series bottom and top entry mixers in different sizes for SPX Lightnin USA. SPX expressed its appreciation towards HIT for the exceptional service and contribution and rewarded HIT with a recognition plaque. SPX has assembled the upper mixer construction with HIT’s Hansen P4 U-size gear unit on top of the platform. The mixer installation is one of the largest mixers in the world. The small blue motor in the picture above is to perform a no-load-test of 75kW at less than 1,000rpm whereas the real motor is a 3m high 2,8MW motor. 1975, 2013 — UKRAINIAN CHEMICAL PLANT ORDERS NEW SHIPLOADER Materials handling at ThyssenKrupp Resource Technologies stands for the design engineering and construction of complete handling facilities for port terminals and stockyards. In 1975, ship loading and unloading equipment was supplied to the Odessa Port Plant, a chemical plant in Yuzhne/Ukraine producing ammonia, urea and other chemical products. Now the customer is once again putting its faith in the expertise of ThyssenKrupp Resource Technologies, a subsidiary of plant engineering specialist ThyssenKrupp Industrial Solutions, with an order for a new 1,000tph (tonnes per hour) shiploader. The originally supplied handling equipment has been operating to the customer’s complete satisfaction for almost four decades. Now the abrasive effects of urea combined with the coastal location have made it necessary to replace one of the older shiploaders. The reliability of the existing equipment and continuous contact with the customer were key factors in the decision to place the new order with ThyssenKrupp. A full range of specialist engineering and construction services and a shipbuilding history stretching back centuries are the strengths of the ThyssenKrupp Industrial Solutions business area. High-quality engineering is at the center of the company’s success. Global project management skills, first-class system integration expertise, reliable procurement and supplier management, and a service offering meeting the highest standards form the basis for lasting customer satisfaction. A total of 18,500 employees at over 70 locations form a global network with a technology portfolio that guarantees maximum productivity and cost-efficiency. For over 50 years, Siegerland Bremsen, well known under its brand name SIBRE remains one of the leading manufacturers of industrial brake systems and drive components. The current portfolio is characterized by a wide breadth and depth of standardized industrial brakes and components for drive technology (e.g. drum couplings, crane wheels, rope sheaves, brake discs, complete assemblies incl. shaft and bearings). This allows the company to fulfil nearly every market demand because a tried and tested standard product is always the basis for customized specifications. SIBRE industrial brakes are applied in port equipment (container and bulk handling), important applications are harbour cranes and belt conveyor systems (gantry travel drive brakes, trolley drive brakes, main and boom hoist service and emergency brakes, storm brakes). Further range of applications for SIBRE brakes are to be found in the mining industry, in steel mills (e.g. hot metal cranes) and wind turbines. All brake systems are equipped with well-proven and concerted thrusters or hydraulic power units of reputable european suppliers. Continuous research and development, in-house testing, as well as ongoing optimization of the production facilities are the platform for the highest quality braking systems SIBRE is known for around the globe. In addition to the product quality, the cost- efficiency of a brake system, i.e. the lowest possible service life costs for the system with regards to maintenance and ongoing operation, is a significant factor for industrial and port systems operators. For this reason, SIBRE doesn’t just focus on new product developments; it places value on optimizing not only the mechanical properties, but also the sensors of its brake systems. Modern brake systems are electronically integrated into and controlled by larger machine systems (e.g. crane or conveyor PLC). At the same time, different brake systems from SIBRE send feedback to the superordinate process control system via the connected sensors and deliver information about the respective status of the brakes. With this information from the SIBRE status monitoring system, maintenance cycles or pending service measures can be determined ahead of time including replacement part procurement without a technician having to look at the brakes first. Modern belt conveyor systems for mining operations or for mechanized tunnelling often come along with the need for controlling and coordinating complex material transport systems consisting of several linked conveyor sections, some with inclined, some with declined orientation. Protecting such complex systems against over-chute as well as belt tension peaks, it is all the more important that intelligent while reliable, low-maintenance braking solutions are being used as service or emergency stop brakes. To reduce mechanical stress and destructive forces on gear box and the conveyor belt, and to brake the system within a given time slot, a set of adjustable hydraulic components is incorporated in the brake control unit for a smooth and controlled induction of braking force. Pre-set, adjustable components guarantee an easy and reliable fine-tuning of brake control at site. An external reference signal (typically the conveyor speed) and a programmed pre-set parameter (typically the braking time) are evaluated and a linear or nonlinear time function is calculated in the process controller. This integral process controller module runs a permanent comparison of calculated characteristic according to the pre-set ramp and the actual speed values. Proceeding from the guide signal generated by the controller, the frequency converter modifies the hydraulic pressure and thus controls the process of braking operation. Safe adherence to brake time stipulations is the initial prerequisite for the realization of the shutdown regime of complex belt conveyor systems. This is the only way to provide protection from surcharges caused by asynchronous stoppage of conveyors. The application of IBC — Soft Braking System — is excellently suited for this job since it ensures the pre-set braking times independent of the conveying direction (up or down) and the loading status. When safety is critical, in applications such as container cranes, steel mills, wind power, mining and lift bridges, SIBRE braking systems have achieved the safety standard and reliability the world market has come to depend on. With its subsidiaries in China, India, Italy, Spain and the US together with its worldwide network of sales and service partners, SIBRE offers an optimum flexibility to accommodate customer needs. With the SIBRE Service Division, highly qualified personnel are able to support customers with training, installation and troubleshooting that exceed expectations. ThyssenKrupp Resource Technologies, formed from ThyssenKrupp Polysius and ThyssenKrupp Fördertechnik, as a customer-driven plant construction and engineering company with strong engineering skills. A wealth of reference plants in all four corners of the globe, a multitude of follow-up contracts and long-term business relations with its customers all bear witness to this. It thus goes without saying that plant engineering and construction will play a key role in the further strategic development of the ThyssenKrupp Group. For this reason, the group is pooling its plant engineering and construction skills under one roof and in January 2014 ThyssenKrupp Uhde GmbH and ThyssenKrupp Industrial Solutions AG will be merged with ThyssenKrupp Resource Technologies GmbH, which will operate in the market under the name ThyssenKrupp Industrial Solutions GmbH from that point onwards. Shortly afterwards, the company will be transformed into a stock corporation. The merger will create a plant engineering and construction company that is ranked among the world’s top ten in terms of size. The company will benefit from decades of experience gained in the completion of over 5,000 plants and excellent engineering skills based on the creativity and inventiveness of over 12,500 employees. With sales of over €5 billion the company will also be in a position to handle projects of a previously unachievable size. The entire management team of ThyssenKrupp Resource Technologies will still be responsible for core business activities at ThyssenKrupp Industrial Solutions AG. Similarly, the usual contacts will also be on hand to assist clients.The rights and obligations arising from existing contracts with what is currently ThyssenKrupp Resource Technologies GmbH will continue intact with ThyssenKrupp Industrial Solutions AG in future as it is considered to be the same legal entity and neither the name change nor the transformation into a stock corporation will have an effect thereon. In parallel, the group is also working towards merging the respective companies belonging to ThyssenKrupp Resource Technologies and ThyssenKrupp Uhde to form – wherever possible – a single company under the name ThyssenKrupp Industrial Solutions in each country. This will ensure that in future ThyssenKrupp Industrial Solutions will have a much bigger and more efficient organizational structure to serve customers’ needs. Major emphasis will also be placed on the global exchange of know-how and engineering services. with products and processes that fulfil the demand for higher material efficiency and greater economical use of resources. Especially in times of scarce resources and rising raw material prices resource-saving operations make sense. This is why the company offers processes and products for customer applications that guarantee the efficient use of materials, smart management of material flows and optimal reuse of raw materials. ‘Solutions – Clean and Green’ is synonymous with products and processes that ensure optimum belt cleaning and material flow control for conveyor installations handling bulk materials. Add to this the gas and watertight fire protection pipe and cable conduits that protect against fire and water in shipbuilding and facility management. Since the acquisition of Cyrus in 2003 F. E. Schulte Strathaus’ portfolio has also included vibration machinery with a modular setup for efficient conveying and screening technology for foundries, forges and recycling industries. Especially in view of responsible handling of materials, the range is rounded off by screening technology. Being in the field of belt cleaning for many years, Schulte Strathaus has designed a new cleaning system for optimum results. polyurethane scraper bar as a secondary cleaner and segmented counter pressure rollers. Scraper bars usually have the disadvantage, that they will not provide good cleaning results, because they can not adapt to the belt. This problem gets even worse when wear occurs, which occurs more in the center of the scraper than on the sides. Ideas to provide convex scrapers have proven to be insufficient as well. Therefore Schulte Strathaus put segmented counter pressure rollers on the inside of the belt directly above the scraper. These counter pressure rollers are 100mm in width, and mounted to a bar with flexible polyurethane feet, just like all scraper segments of the proven STARCLEAN® system. These segmented rollers are now twisted when the scraper is tensioned, and every roller uses its own flexibility and pretension, to press the belt to the scraper, providing the best possible cleaning result.When an obstacle passes the scraper, the rollers are flexible enough to hinge away and save the belt. This system has proven itself now as the ideal solution for sticky, abrasive materials and for the optimum cleaning result, for belts up to 1600mm in width. The total bulk cargo segment for the Port of Hamburg was able to report growth of no less than 8.9% to 31.4mt (million tonnes) in the first three quarters of 2013 writes Axel Mattern, Executive Board Member Port of Hamburg Marketing association. In the first nine months of 2013, bulk goods handling therefore contributed around 44 percent of the growth in all seaborne cargo handling in the Port of Hamburg. All three bulk cargo segments reported positive throughput figures for the first nine months. At 5.9mt, throughput of suction cargoes that include grain, oil fruits and feedstuffs, was up by 30.9%, in percentage terms the strongest growth. The grab cargo segment, mainly comprising ores, coal, coke and fertilizers, reached 14.5mt, up by 2.1%. For the dry bulk cargo segment the port expects a total handling in 2013 of 27.5mt (+9%). On the export side the port expects a growth of 28% up to 7.3mt, the import will be 20.2mt, an increase of 3%. Since 1978, when ts-systemfilter gmbh was founded, the company has been developing filtration devices for the bulk material processing industry which are used worldwide in all industrial sectors. Applications in which heat, pressure shock resistance, filter changes without contamination and other factors play a significant role are streamlined by the company’s modular system. This modular system for filtration units includes several components by means of which the filtration systems are connected and adapted for widely differing tasks. Various kinds of star filters, hose filters, filters made of sintered plastics in combination with different series offer many opportunities to implement the required filter area.The equipment for the regeneration of the filter apparatus may be selected from mechanical semi-automatic cleaning by the shaker motor and fully automatic compressed air cleaning devices. The ts-systemfilter apparatus is of compact construction and can be directly mounted at the receptacle. The filtering media used warrant a consistent separation of the bulk goods from the carrier gas in a sustained manner. ts-systemfilter gmbh will test the solution for the application in systematic stages.The bulk goods will be classified according to the ts-filter standard and compared with the bulk goods databank. A bulk goods test establishing the optimal applications for the ts-systemfilter units, filtering media, service life, gas purity values and many other data allows the selection of the customized ts-systemfilter apparatus. Numerous domestic and foreign patents relating to many individual components demonstrate the sustained power of innovation. Owner-manager Hartwig Straub has filed more than 50 patent applications. After numerous patents granted over the years three more patents were issued in 2013, one for the multifunctional star filter ts-x, one for the use of a PTFE-membrane facilitating the regeneration of the filter surface and the most recent one for a process of excluding the formation of ignition sources inside the ts-filter apparatus. For the manufacturing of household appliances more and more powder coating is used because of economical reason. The overspray is recovered by the product separator. The deposited product now is added to the fresh-powder and can be reused. It is combustible powder, electrostatically charged for coating. The filter apparatus complies with the ATEX-guideline. As an example we select a hygroscopic bulk material like sugar powder, enriched with syrup.T he humidity of the product in the suctioned total volume of 14,000m3/h is very high. For three- shift operation, a filter apparatus with fully-automatic compressed air cleaning is selected for the regeneration of the filter surfaces. The company regularly exhibits at the ACHEMA in Frankfurt, Germany, which takes place every three years. ts-systemfilter gmbh has sales partners in various countries and provides 24-hour service within Europe. Different types and individual production of filter units with filter areas of over 200m2; star filters; an almost unlimited variety of folds or filter media; hose filters; extension systems, e. g. weather cowl and acoustic hood for installation outside, fans, rotary valve. The holding and management company of the Port of Duisburg, duisport, has been operating the ‘Kohleninsel’ (coal island) in Duisburg-Ruhrort since summer 2013. The Kohleninsel, which had previously been operated by RBH Logistics, a subsidiary of DB Schenker Rail Deutschland AG, is one of the most efficient facilities in Europe for handling and mixing coal and for its intermediate storage. Due to the area’s trimodal connection, loading can also be carried out on the water directly into inland waterway vessels. The 20ha site, which is operated 24 hours a day seven days a week, has a total capacity of around 4mt (million tonnes) per year. The Kohleninsel has an extensive and modern infrastructure. For example, eight trains can be processed per day on train-length tracks. The permanently installed crane has a daily capacity of over 8,000 tonnes, which can be increased flexibly by using an additional mobile crane.The conveyor systems available have a daily output of 9,000 tonnes for loading wagons. “By taking over the Kohleninsel we have set the course for further growth.The positive developments of the last few months have shown that the site is among the most up-to- date facilities in Europe and is very competitive. Therefore, we are confident that we can continually increase volumes also in the coming year,” says Erich Staake, chief executive officer of Duisburger Hafen AG. The Port of Duisburg has a total of five import coal terminals. 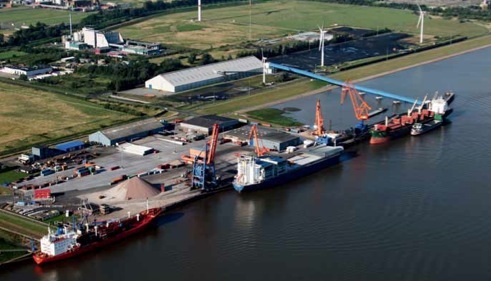 In 2012, 7.6mt of coal in total were handled in the Port of Duisburg.